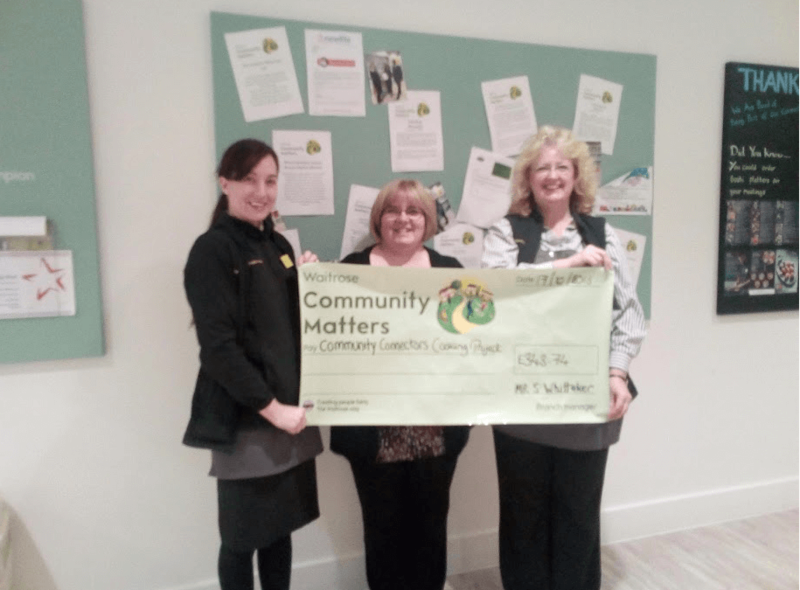 Our Community Connectors Group were supported with a donation of £343.74 from the Waitrose store in London Road, Worcester. Customers at the store voted to support the cooking project that we will be starting across the Connectors Groups from November 2018. Paula Morris Community Connectors Volunteer Co-ordinator at Worcester Community Trust said, “We are extremely grateful to Waitrose and their Customers for their very generous donation, which will enable our service users to learn to cook healthy meals during sessions and eat together with other participants. These will be wonderful social occasions which give opportunities for learning and reducing isolation”. She added, “We are looking to strengthen our relationship with the Community Matters Team by delivering pop-up Connectors sessions in the future using the facilities at the London Road Branch”. At the end of Waitrose Customers shop in branches, they are given a token to place in a box of the good cause they would most like to support. The more tokens a cause gets, the bigger the donation they receive. Each month every Waitrose & Partners branch donates £1,000 (£500 in Convenience shops) between 3 local good causes. For more information about our Community Connectors Project please visit the Connectors page.